Congratulations on your journey to becoming homeowners of your dream home! While you’re busy looking at home designs and talking to architects and home construction contractors, think about reaching out to landscape architects and contractors at the same time. By coordinating the two, not only will you get a more beautiful final product, but you can also avoid the problems (and added costs) of doing both separately. In this article, we’ll go over the common issues of leaving landscaping until after construction, and some of the perks of starting early. Home construction is not kind to your landscape. Whether you’re building up (or over) an existing structure, or starting from scratch on an empty lot, it’s unlikely your landscape will survive intact. 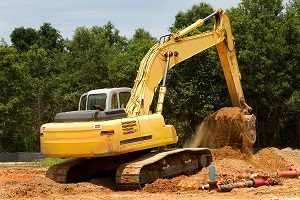 Heavy construction equipment, groundbreaking for foundations, and underground utility installations are going to leave your landscape in tatters. Some construction companies may grade the ground and toss on some grass seed if you’re lucky, but if you’re looking for a beautiful landscape to go with your beautiful new home, it pays to contact a landscaping company before any construction even starts. Environmental Impact: Building both a house and the perfect landscape can affect the land and environment around your home. By having your landscape and building architects working together, you can minimize issues such as landslides, pooling water, and other damage to your home, landscape, and the environment. Extending Your Living Space: Many modern homes focus on maximizing indoor space, but that doesn’t mean you should ignore your exterior. Working with a landscaper to make the most of outdoor spaces, even in small outdoor spaces, works best when you bring them on early. Complementing Construction: Looking to install outside features such as a swimming pool or outbuildings during home construction? A landscaping company can help enhance these projects, such as hardscaping for swimming pools. Permits and Utilities During Construction: Depending on your landscaping choices, construction permits and installations between both sets of contractors may overlap. Having gas lines installed to the house and a new fire pit at the same time make much more sense than breaking ground again. Landscaping is too often an afterthought on home construction after the builders have packed up their tools and left devastated landscape behind for you to worry over. Landscaping should be an integrated part of your home, enhancing the function and form of it while also making your outdoor environment appealing and safe for use. Want to learn more about landscape design and development during home construction? Contact Greener Horizon. We’re experts in both landscape design and development on both private and commercial property, and can help you produce the perfect landscape to complement your new home.